Blood Sugar Balance is a comprehensive and holistic approach to the restoration and maintenance of normal blood glucose. It addresses the primary concerns associated with maintaining healthy blood-sugar control. The nutrients in Blood Sugar Balance work from several different perspectives; they exert an insulin-like effect, improve insulin sensitivity, and support healthy nerves from free-radical damage associated with unregulated blood-sugar levels. Diabetes can lead to complications such as neuropathy, retinopathy, renal problems, high cholesterol, and hypertension. 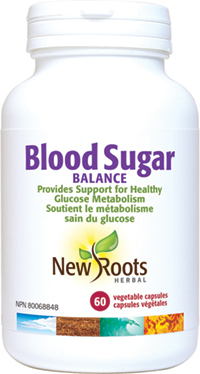 Blood Sugar Balance harnesses cutting-edge nutraceuticals for natural blood-glucose management integral to good health. According to Diabetes Canada, one in three Canadians are living with diabetes or prediabetes. The staggering statistic is that 90% of cases are type 2 diabetes, which is related to impaired insulin production or poor insulin receptivity. The good news is that lifestyle changes such as eating more whole foods, reducing sugar intake (this includes reading labels for hidden sugars), and leading a more active lifestyle can lessen type 2 severity. Many people do not realize they have blood-sugar-control concerns, nor do they seek medical advice until it has progressed to a serious stage. Early signs include frequent urination, excessive thirst, and excessive appetite; these symptoms should not be ignored. Genetics can also lead to diabetes, so an awareness of your family medical history can help in addition to adopting a healthy lifestyle. Blood Sugar Balance can also prove to be an ally for getting the most out of life while living with diabetes. Our chromium picolinate benefits include weight loss, lowered serum cholesterol and glucose, increased burning of fat, and muscle growth.